See also information brochure for Swat. The conference fee is 2000 NOK for regular attendees and 1200 NOK for students (1 USD ~ 8.4 NOK). Note, the price increases with 500 NOK after May 22. The fee includes buffet lunches, coffee breaks, a reception, a copy of the proceedings, and the conference dinner. On Tuesday July 4th 6 pm. , the day before the conference starts, there will be a welcoming reception hosted by the City of Bergen. The reception will be held in the 500 years old Schøttstuene close to the old harbour (Bryggen). The dinner will be held Thursday July 6th on Mount Fløyen to where we travel by funicular. Additional tickets for the conference dinner can be purchased at 500 NOK. On Saturday July 8th there will be an excursion. This is the popular "Norway in a nutshell", a full day trip where we leave Bergen by train in the morning, traveling first up to Voss where we change to a bus which will take us down to Gudvangen by way of the steep Stalheimskleiva hairpin curves. We board a boat and proceed out Nærøyfjord, one of the narrowest fjord arms in Europe, and then follow the Aurlandsfjord into Flåm. In Flåm there are several restaurants, and the participants are on their own for lunch. We then take the "alpine train" up the spectacular Flåm valley, arriving at Myrdal high in the mountains. From Myrdal a regular train takes us to Voss, where again we have a pause. Finally, a train takes us back to Bergen. The excursion starts and ends at the railway station which is right next to Hotel Terminus. We leave at 8:30 in the morning and expect to be back in Bergen at 8:00 in the evening. Tickets for the excursion are not included in the conference fee but are ordered separately (500 NOK). Note that if you participate on the excursion you will be given only one receipt covering both the conference fee and the excursion. 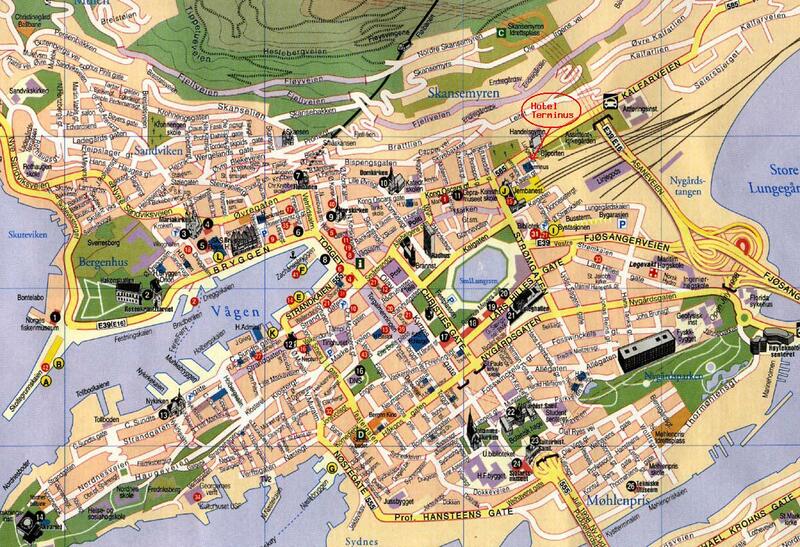 The conference will be held at Hotel Terminus in the center of Bergen. See this map for the exact location. We have reserved a number of rooms at special prices for the conference. The price for a single room is 650 NOK and 900 NOK for a double room per night. This also includes breakfast. These rooms are reserved until May 22, after that you are on your own. If you do not want to stay at the conference hotel you must find your own accommodation. Be forewarned that Bergen is a very popular tourist town and finding hotel rooms during the summer can be very difficult. Note also that Bergen is a Cultural City of Europe this year. Hotels bookings are said to have doubled already compared to last year. Rooms at Hotel Terminus are ordered through the conference and should be paid upon departure. The hotel accepts all major credit cards. Go to the registration page to register for the SWAT 2000 conference and to reserve accommodation at Hotel Terminus. 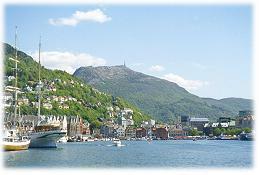 Bergen is situated on the west coast of Norway. The easiest way to get to Bergen is by airplane. From the airport (Flesland) you can take the bus to the center of town. This leaves approximately every 20 minutes just outside the arrival hall. (The bus costs 45 NOK, you can also pay in US$). If you do not have Norwegian currency when arriving there is an automatic cash dispenser in the airport that accepts most credit cards. Tell the bus driver (he speaks English) that you are going to Hotel Terminus and ask him to instruct you where to get off. He will drop you of just below the yellow colored building marked with a circled I on this map. From there there is a 3 minute walk to the hotel as indicated on the map. It is also possible to get to Bergen by train from Oslo. This is a very scenic ride and takes about 7 hours. When you arrive at the train station in Bergen (circled yellow J on the map) leave by your right side as you are leaving the platform and walking into the main train station. When you get out on the street the hotel is just across the street. If you are arriving by car, the best place to park is in the main parking garage "ByGarasjen". This is in the building marked with a circled yellow I on the map.